Summer is nearly here and now is the time to get your trailer ready for summertime fun (or chores). One of the most important tasks is to make sure your lighting is working properly. Many of us will find that the winter has not been kind to our trailer’s wiring. It may have fallen victim to corrosion or rodents. If your trailer’s wiring is giving you problems, here are some tips to help you get it back up and running. 1. Check the grounds. Ground issues are the number one cause of trailer wiring problems. When in doubt start there. Clean all ground connections. Ideally, each component will have its own ground to the trailer frame. If you are getting strangely flickering lights, your trailer may be grounding through the hitch vs through the trailer wiring connector. If the vehicle ground wire is stacked with other wires on one screw, consider moving it to its own screw or at least to the bottom of the stack.If your ground wire looks at all like this picture, the wiring could be corroded under the insulation and you should consider replacing the entire wire - or at least the last several feet. 2. Check any terminals or in-line connections. 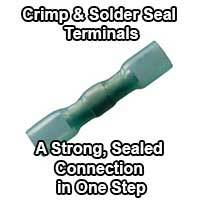 Replace old crimp only and non-sealed terminals with Crimp & Solder Seal Terminals. Crimp only terminals can often have a poor connection even though they feel tight. Corrosion can grow within them and even grow down through the strands of the wires. 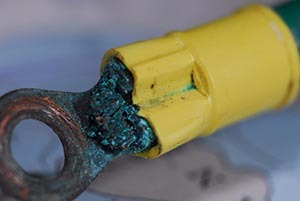 A sealed connection created by Crimp & Solder Seal terminals is stronger than the wires themselves, has no voltage drop across the connection, and prevents any contaminants from entering. Check out this video about Crimp & Solder seal terminals. They are available for purchase here. 3. Check any fuses. If you have a powered converter, make sure it’s fuse is still good. Check the lighting fuses on the tow vehicle. Check over the wiring on both the vehicle side and the trailer side for any in-line fuses and test. If you continue to experience blown fuses, you may be overloading the circuit – replacing trailer lighting with LEDs is one possible solution to this issue. 4. Determine whether the problem lies with the trailer wiring or the tow vehicle wiring. Test the trailer while not connected to the vehicle. You can take a vehicle side wiring harness and wire it to a standalone battery or ‘jumpstarter’ pack. Simply connect all the colored wires to the positive and the white wire to the negative. If your trailer's lights work properly with this setup, you'll know your issue lies with the tow vehicle. 5. Consider re-wiring. Wires can corrode from within making problems hard to find. Insulation can crack with age and cause shorts. Many times if your wiring has already been repaired several times, or is just getting old, it is more efficient to go ahead and rewire the trailer rather than continue to add band-aid fixes. Complete kits are inexpensive and can often be installed in an afternoon. 6. Check the grounds. Yes it is worth saying it again! Make sure your wiring has clean, secure grounds.